Never winning a Cup has got to be heart-breaking. Roenick shows just how big a deal the Stanley Cup is. Only the Cup can make grown men cry each and every time. Everybody should win at least one Cup in their career, or at the very least, get a chance to win a Cup. in case you haven’s heard, it’s kind of a big deal. 20 Cent’s game-winner last night was no beauty. In fact, it was a pretty ugly goal. But who cares? A goal is a goal, no matter how pretty it is. Ugly goals come from hard work, and in this case a true talent. Stars fans, of course can relate to this mantra. The goal that won us our first and only Cup came from Hall of Famer (and Ambassador of Fun), Brett Hull. You would think that it’d be a “hull” of a shot that came from him. It wasn’t though. Rather, it was a goal earned from a lot of chipping and persistance. 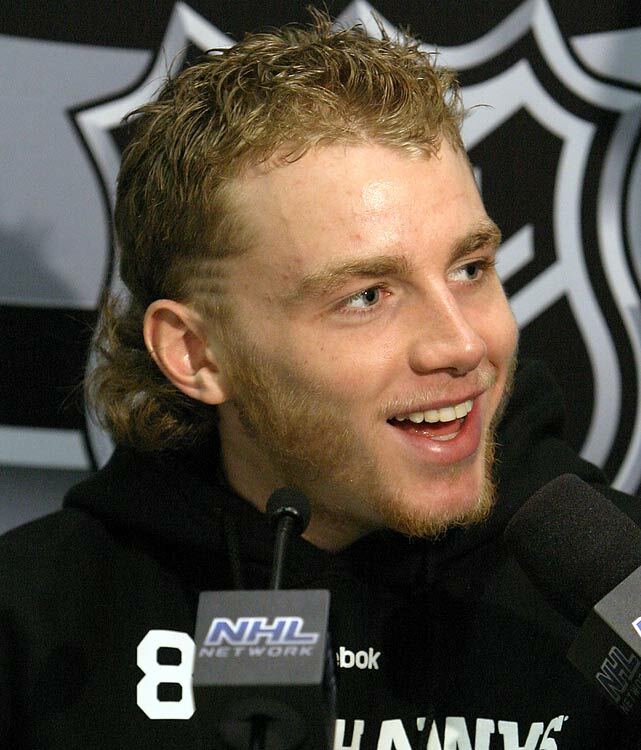 That goal isn’t ugly. It’s the most beautiful thing I’ve ever seen. 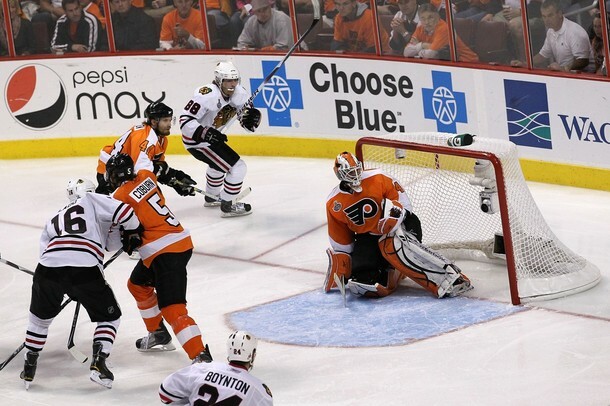 Speaking of Hull’s cup winner, people are now using Kaner’s OT winner in the same sentence as Hull’s. Both were chippy plays. Both were confusing. And, yes, both were actual goals. So is Chris Pronger and his puck-stealing escapades. 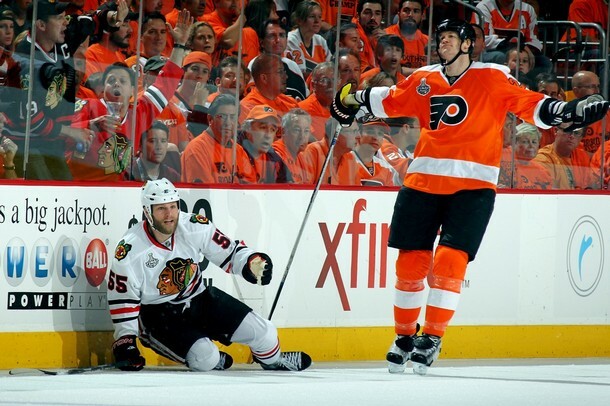 This photo isn’t exactly Pronger in his puck-stealing glory, but it makes me giggle. Me and Chris Pronger have a love/hate relationship. BTW, the Baby Stars face off against the Hershey Bears in the Calder Cup finals. Make it happen, kids. That has got to be one of the worst things I’ve ever heard an announcer say. Shame on Brian Hayward. That was just horrible of him to say. The way Seabrook went down was disgusting. Wisniewski is a dirtball and that was a dirtball hit. Think about it: Wisniewski is a defender, and he comes in from the blueline well ahead of speedster, Teemu Selanne. What does that tell you? Seabrook himself had had a questionable hit on Corey Perry, but that was nothing compared to Wisniewski’s. He deserved all eight games. Thank you, NHL for finally getting it right. What. A. Game. I’m not gonna lie, but that was really intense, and there were moments when I thought I’d pass out. It reminded me of that intense Detroit game on January 12, 2009 when the Stars played a great game and never gave up. Awesome, awesome effort by the Stars. Especially Alex Auld. He kept them in the game, and he stole it. And how about that penalty kill? They were pretty good in the PK, and I really noticed Tom Wandell and Loui Eriksson in that category. Huet wasn’t great; I’ll admit that. However, the team in front of him was. They took shot after shot on Auld, and he brilliantly saved them all. The line of Morrow-Ribeiro-Benn was easily the best one out there, with the fourth line a close second. Sadly, we didn’t see much from Neal-Richards-Eriksson. All three were rather silent, except for B-Rad’s awesome defense and Loui’s PK’-ing. Neal didn’t have a very good game, considering his turnover led to the first Chicago goal. Then, there’s Niskers. Sigh. Niskanen, Niskanen, Niskanen, what are we to do with you? He had an awful game, and I felt horrible for him. But the Stars won, so a win is a win, no matter who plays badly. Next up: the LA Kings tomorrow night. See you there!